In the long battle between East Coast versus West Coast for best burger, it's usually down to In-N-Out and Shake Shack. I always stop by Shake Shack each time I'm in Boston. My usual go-to burger is an off-menu item called the ShackMeister. The ShackMeister consists of an 100% all-natural Angus beef cheeseburger topped with crispy marinated shallots and ShackSauce. It's delicious and remains my favorite of the Shake Shack burgers. For those that don't know, this burger made its way to stores by being the winning entry at the 2014 Food Network South Beach Wine & Food Festival Burger Bash. But as I walked up to the counter to order my trusty ShackMeister, I noticed Shake Shack was running a special surf-and-turf burger. The newest addition to the Shake Shack family is the “Surf N’ Shack”. 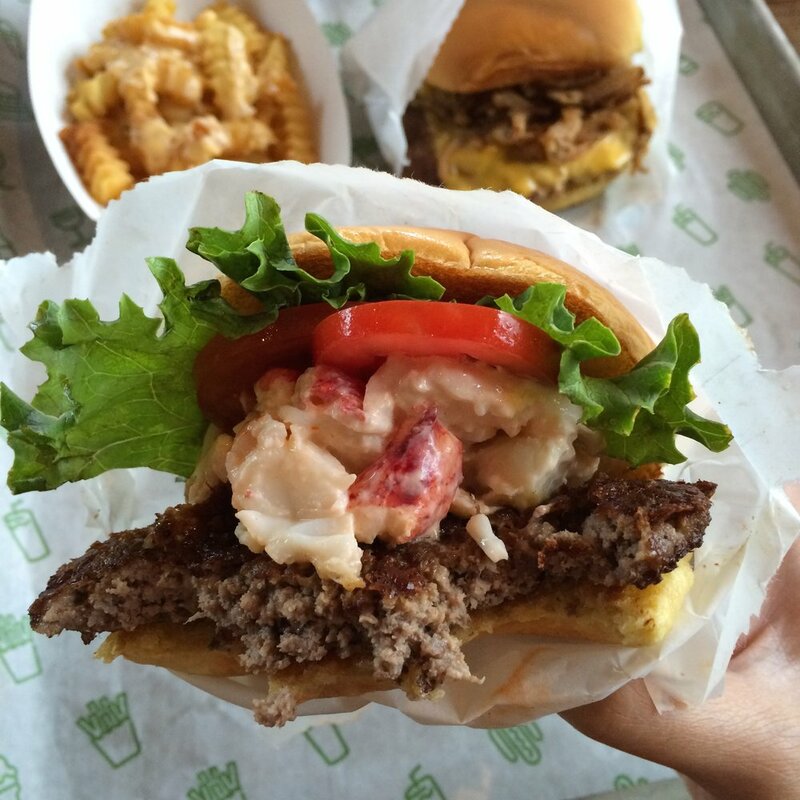 This new burger is a surf-and-turf with 100% Angus beef, Maine lobster, lettuce, tomato, and ShackSauce. After trying the burger, I think the burger is a fun, one-time order for me. Instead of ordering a more expensive lobster roll, I'd recommend getting a Surf N' Shack. For $8.99, there's a good amount of Maine lobster. The sweetness of the lobster nicely juxtaposes the Angus beef patty. Although the Surf N' Shack was good, I can't say it is better than my trusty ShackMeister. The Surf N' Shack is only available until September 20th and to New England residents. I ended up ordering a ShackMeister and one of the limited edition Surf N' Shack burgers so I was fully satisfied. I topped it off with an order of cheese fries and everything was good in the world! What do you think of the new Surf N' Shack from Shake Shack? Would you order Maine lobster on your burger?